Toolholding for rotating round tools—end mills, drills, and taps—continues to evolve with innovative designs aimed at guaranteeing precision, security, and repeatability. As a result, suppliers of toolholding technology have made supporting the precision, security, and repeatability of shrink-fit, mechanical, and hydraulic toolholding the highest priority. You don’t have to look any further than the recent offerings from tooling suppliers to find better ways to improve metal removal rates, part quality, and tool life. The challenge always is to transmit machining force from the machine’s rotating spindle to a metalcutting tool. Toolholders have a front end to grip the rotating round cutting tool and a back end connection to the machine tool spindle. 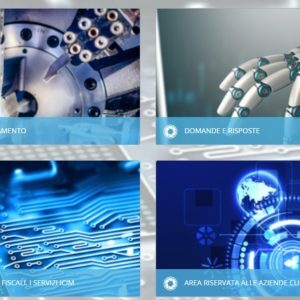 Back end choices to connect to the machine spindle include CAT (ISO), BT (JIS), HSK (DIN), KM (ISO), and Capto (ISO) standard interfaces and the proprietary BIG PLUS. Each has its particular strengths for milling, turning, and drilling, and each requires precision machining, usually grinding, gaging, and advanced inspection to be manufactured to the required precision specifications. For front end connection to the cutting tool, there are a number of technologies to choose from that have been developed to meet the challenges of high-speed cutting (HSC), heavy-duty roughing of difficult-to-machine metals like Inconel, and sophisticated toolpath strategies. The main culprit that can lead to catastrophic and costly scrapping of workpiece is tool pullout from the toolholder. One chief remedy that has long been identified as beneficial is high gripping torque. 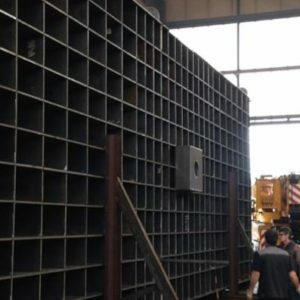 To provide additional security, tooling manufacturers have come up with rather ingenious solutions to guard against the possibility of pullout. “When you look at toolholders, there are four important considerations: rigidity, accuracy, balance, and security,” said Brendt Holden, president Haimer USA (Villa Park, IL). “If you don’t have good taper contact and a properly made interface, you’re not going to be rigid to start with as far as how you interface with the machine spindle. You need balance so that the toolholder is able to hold the runout accuracy properly, and you need security to prevent tool pullout. Safe Lock’s locking principle results from helical grooves that are ground on the cutter’s shank so that they can interface with the form-closed drivers in the holder. The helical form of the groove protects the tool against overturning and pulling out. To counter this tendency Haimer developed SafeLock, which combines a shrink-fit chuck or another high-precision chuck with locking elements. The locking principle results from helical grooves that are ground on the cutter’s shank so that they can interface with the form-closed drivers in the holder. The helical form of the groove protects the tool against overturning and pulling out. “The modification to the cutting tool shank is straightforward and symmetrical. In fact, cutting tool suppliers have found that they are able to add the SafeLock grooves to standard stock end mills, or even end mills that have an existing Weldon flat,” said Holden. “The grooves don’t greatly affect the balance, which is an issue with the Weldon flat. In fact, the modification keeps the cutting tool stronger since the grooves are very shallow as opposed to a deep Weldon flat cutting through a great portion of half the shank,” said Holden. Recognizing that toolholders must provide strong gripping force, high precision, and vibration control in machining difficult-to-machine materials aggressively, Rego-Fix Tool Corp. (Indianapolis) developed secuRgrip, a special threaded insert or key that locks cutting tools in place, eliminating cutter pullout without the need to alter cutters. The simple and effective design of secuRgrip is part of the company’s well-established powRgrip mechanical toolholding system and one that allows the use of any off-the-shelf tool as long as it has a common standard Weldon flat on its shank. The secuRgrip further enhances the already extreme holding capability of Rego-Fix’s well-established powRgrip mechanical holder system. To lock a cutter in place, the small insert of the secuRgrip system is placed in the Weldon flat of a cutter. The bottom profile of the insert matches that of the Weldon flat, and its exposed side has a thread pattern that matches with those of internally threaded powRgrip system collets. Users hold the insert in place while sliding the tool into the collet. The collet is turned so that its threads engage with those of the insert, and the tool is then screwed all the way into the collet. This cutter-collet assembly is pressed into a powRgrip system holder, and a special external cap nut is tightened onto the holder for added pullout security. 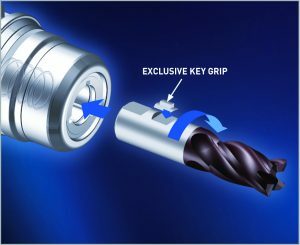 BIG Kaiser’s Mega Perfect Grip features a unique lock mechanism using a key grip prevents the slip and pullout of the tool during heavy cutting and accepts industry standard Weldon flat milling cutters (ASME B94.19-1997) and doesn’t require special grinding of the milling cutter. Users with existing powRgrip holders can easily transform their systems into a secuRgrip holder by simply threading the outside of any powRgrip PG 25 or PG 32 holder for accepting the cap nut. Rego-Fix can either supply the necessary thread specifications or factory-threaded holders. The secuRgrip holders accommodate cutter diameters from 0.472 to 1.000″ (12–25 mm). With holder body tensile strengths higher than those of the cutting tools being held, the secuRgrip holders will withstand cutting forces that could break the cutters before ever damaging the toolholder itself. Vibration-dampening capabilities of secuRgrip are critical for today’s increasing machine tool spindle speeds and feed rates, leading to a tighter TIR, increasing tool life and improving part accuracies and surface finishes. The powRgrip and secuRgrip systems ensure concentricity (TIR) with deviations of less than 3 µm for tool lengths up to 3×D diameter and length pre-adjustment with a repeat accuracy of less than 10 µm. The powRgrip system absorbs vibrations by creating “material breaks.” Rego-Fix’s use of different materials, all with their own unique harmonics/frequencies, creates breaks or gaps. These gaps—between the cutter and collet, collet and toolholder body—provide a natural vibration-dampening capability. As mechanical designs, powRgrip and secuRgrip are also faster than other systems when it comes to exchanging tools. Removing a tool from a holder and installing another takes about 10 seconds. Heat-shrink holders, on the other hand, must be heated, the cutter installed, then put in a chiller for two or three minutes before the tool can be used. The Speedsynchro tapholder from Emuge Corp.(West Boylston, MA) features an integrated transmission of 1:4.412 for optimizing thread production on CNC machines with synchronous spindles. Speedsynchro is achieving increased cost savings, time savings of up to 40%, and a reduction of energy consumption of more than 90% compared with synchronous thread machining, and a dramatic increase in tapping output. This is due to considerably shortened thread production cycles resulting from the combined fast acceleration and cutting speeds aided by the integrated transmission. This is particularly effective for high-production tapping operations such as those in the automotive manufacturing industry. In addition, tool life and thread surface quality are optimized due to a patented minimal length compensation function that reduces the axial force on the tap, enabling longer tool life. The Speedsynchro technology combines the integrated transmission with minimum length compensation, offering a way to efficiently work with high cutting speeds and a relatively low synchronous machine tool speed that compensates for synchronization errors during the threading process. Through this technology, it is now possible to run machine spindles in a noncritical energy-saving RPM range during thread production. Exact thread depths can be achieved with Speedsynchro as it doesn’t reverse the direction of rotation. Speedsynchro toolholder supports a maximum spindle speed of 2000 rpm and a maximum tapping speed of 8824 rpm. Cutting range is from M1-M8 and an ER16 toolholder size is offered. Internal coolant capability is provided. Part of the powRgrip mechanical toolholding system, secuRgrip features a special threaded insert or key that locks cutting tools in place, eliminating cutter pullout without the need to alter cutters, allowing the use of any off-the-shelf tool as long as it has a common standard Weldon flat on its shank. In addition, Emuge has expanded its patented Softsynchro tapholder line, adding two new holder series. Constructed from two separate, precision-ground sections, the body and the shank, Softsynchro’s patented design significantly increases tool life and performance. This proprietary design reduces axial force to just a fraction of the force typical in tapping applications, substantially extends tool life by up to 300% and improves thread quality. Softsynchro’s technology features patented elastomer springs that separate the spindle from the tap, absorbing excessive axial forces and compensating for small errors in the machining process. Torque from the spindle is transferred seamlessly to the tap via ball bearings riding in precision ground grooves. These ball grooves minimize rolling friction on the torque transmission balls to guarantee precision micro-correction of lead errors in a rigid tapping cycle, even under the most demanding machining conditions. The Softsynchro modular system also eliminates the need to purchase different holders for each application. The tapholders are designed for a wide range of applications and have coolant-through capability. New sizes can handle tap ranges from #0-1 and M2-M30. New sizes include Softsynchro 0 for tap ranges #2-10 and M2-M8, and the Softsynchro 4 for tap ranges 7/6–1″ and M12-M30. The Mega Perfect Grip from BIG Kaiser Precision Tooling Inc. (Hoffman Estates, IL) is a highly accurate milling toolholder with fully concentric clamping with runout less than 0.0004” (0.010 mm) @ 4xD. It accepts industry standard Weldon flat milling cutters (ASME B94.19-1997) and doesn’t require special grinding of the milling cutter. “A unique lock mechanism using a key grip prevents the slip and pullout of the tool during heavy cutting. By simply using straight shank cutters with a Weldon flat, no special cutter is required. If the cutter doesn‘t have a flat, adding a flat according to the general Weldon standard allows its use in the Mega Perfect Grip,” said Alan Miller, engineering manager and product manager. “Aerospace applications, for example machining titanium, Inconels, and high-volume aluminum milling require anti-pullout toolholders like the Mega Perfect Grip high-torque milling chuck,” said Miller. “They provide security so that the tool can’t pull out of the toolholder in roughing and high metal removal rates, which is especially important when machining larger structural aluminum workpieces. Aluminum cutters typically have a lot of axial forces that are trying to pull the cutter out of the holder. Any tool slippage can result in scrapping parts. With the key that goes into the Weldon flat there isn’t any chance of that happening,” said Miller. “For smaller applications and general-purpose materials, BIG Kaiser’s Hi-Power Milling Chucks achieve powerful clamping for 100% optimized performance during heavy-duty end milling. Fine slots and needle bearings assure powerful and precise clamping. Even though a milling chuck is for heavy cutting, the Hi-Power Milling Chuck keeps runout accuracy of 0.0004″ [0.010 mm] TIR at 4×D. This product has recently expanded to now include direct clamping of Ø.500” and Ø12-mm cutting tools. We have labeled these chucks as the HMCJ series,” said Miller. “The Hi Power Milling Chuck Type J is designed for roughing applications on 30 and 40-taper machines, providing higher clamping forces than a traditional collet chuck or end-mill-style collet chuck in roughing applications. Target for the Hi Power Milling Chuck is higher metal removal rates, better clamping on the smaller 30-taper high-torque spindles like those of Robodrills, allowing more aggressive machining,” said Miller. “An HSK 25 hydraulic chuck is available for small tapers in applications like medical and mold and die. It’s a hydraulic chuck for applications where there have been only collet chucks available. The benefit of the hydraulic chuck is in microfinishing where vibration damping, and repeatability are required running at spindle speeds of 60,000 rpm or more,” said Miller. “All of our collet chucks guarantee 3 μm at 4xD, generally three to five times better than what customers are getting as well as real improvements such as better finishes, better part geometry, and better tool life,” said Miller. For those shops looking for an alternative to shrink-fit holders due to constraints in diameter, offsets, and length, Schunk Inc. (Morrisville, NC) has developed the Tendo Slim 4ax as a drop-in replacement manufactured to the same dimensions as a shrink-fit holder. “All you have to do is pull the shrink-fit out, and replace it with the Tendo Slim 4ax. You don’t have to go through the setup process, and the expensive equipment that is associated with shrink-fit,” said Matt Panosh. With 28 variants, the Schunk Tendo Slim 4ax toolholder is designed for axial machining applications including reaming, drilling, counterbore/chamfering. and thread tapping. The Tendo Slim meets all requirements, including heat shrinking contour per DIN 69882-8, simple handling, short setup times, long tool service life, high flexibility along with plug & work, and applications with minimum quantity lubrication as well. “The Tendo Slim 4ax is really designed for higher volume machining, typically for automotive applications where there are a lot of drilling, reaming, and holemaking with tools ranging from 6 to 32-mm diameter, as well as inch sizes,” said Panosh. “The Tendo Slim 4ax is also well suited for boring, counterbore/chamfering, reaming and threading in five-axis centers and in die and mold construction. Permanent run-out and repeat accuracy is less than <0.003 mm, and the toolholder is suitable for high rotation speeds with a balancing grade of G 2.5 at 25,000 rpm. Available in HSK A63, additional taper offerings will be added. Copyright © 2017 Gualandi Meccanica. All Rights Reserved.